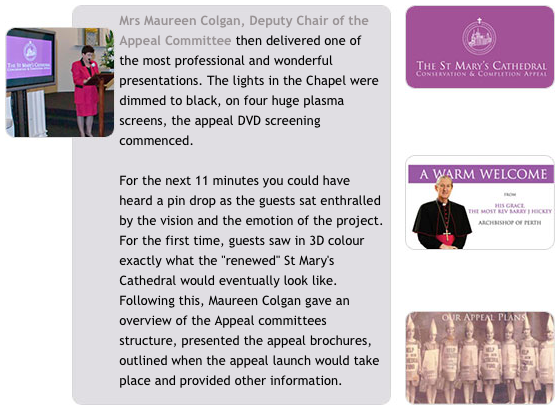 Finally, after years of planning, development and a lot of hard work by a lot of good people, our St Mary's Cathedral Appeal campaign was ready for its first public unveiling. 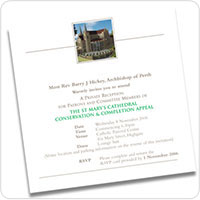 Archbishop Hickey invited all Appeal Patrons and Members of his Project and Appeal Committees to join him for a very special Private Reception on 8 November 2006. This was an occasion for His Grace to express his personal appreciation to those who would be working to help make the dream of completing St Mary's Cathedral a reality. In addition, the now completed appeal materials and the overall appeal plan were to be "unveiled" for the very first time. To mark the special nature of what was to occur, special invitations were designed and dispatched. 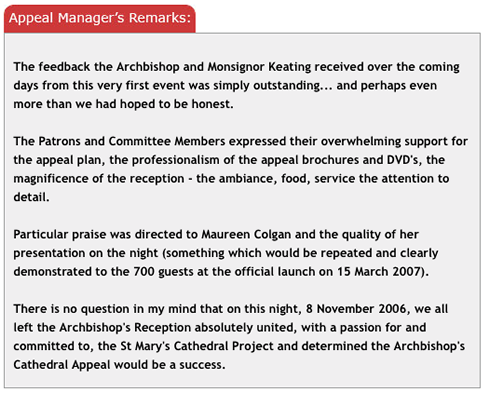 The reception was held at the Catholic Pastoral Centre in Mary Street, Highgate. Over a 24 hour period, with the magnificent assistance of Mr Mark Williams and his company Austage, the seminar room and the Chapel were transformed into one of the best reception and presentation areas I have seen, which you can also see in the photo gallery provided. Remy and Keryn from Bloom by Design filled the room and the Chapel with the most beautiful flowers and Jodie Margaria, Events Coordinator for Heyder & Shears Exclusive Caterers, made sure the Archbishop's guests were served delicious food and wine...thanks Jodie, the service was wonderful! Guests assembled from 6.30 pm to be personally welcomed by His Grace and Monsignor Michael Keating. At approximately 7.15 pm, the guests were invited to make their way into the Chapel for the formal presentations. Archbishop Hickey gave an inspirational address...not a speech, but words "straight from the heart" as many guests commented afterwards. He spoke of the Cathedral, its importance to all of us whether Catholic or not, how this was an exciting opportunity to share in a once-in-a-lifetime historic event and how grateful he was for all the Patrons and Committee Members support.